Great Ideas? Average Events? Small People? I’m sure many people have heard this, especially those who have initiated themselves into an “awakening” of looking into reality more deeply, possibly getting into “conspiracy” research to uncover the hidden machinations going on in the world. Where does this saying come from? What are the meanings it conveys? How can this statement be understood? I will give my take on how it can apply. People are the most visible of the three, easily seen through external appearances, and exist in themselves as primary substances (philosophical metaphysics). What we see is most evident and readily available to be discussed. We can talk about those close to us, or those we have never met, yet see on TV or movies. Usually, these are vapid conversations with little meaning. It doesn’t always get people anywhere except wasting time talking about something that doesn’t matter (but sometimes the person does matter to what is happening and needs to be discussed). Spending most of your time gossiping about others is a lower form of consciousness engagement that doesn’t really get anywhere most of the time. Many people just like the drama of talking about others and bad-mouthing them without actually getting somewhere or making a real point about an issue, without any real criticism being levied. Valid criticism about someone is always valid, but seldom does it go this way, as many people instead focus on things that are easier targets to get people to dislike someone for a reason that has no bearing on an issue. One’s self-image and self view can be lessened and distorted when comparing to others. This is exacerbated by celebrity culture which tries to engender us to emulate what others do, what they wear, how they speak, etc. This puts a lot of pressure on a person to conform to a certain image, and recognize how the image of themselves does not match up. Role models aren’t bad, but idolization and envy or jealousy can result in not feeling good enough about one’s self and engender a desire to either emulate what is perceived to be better by forming the person into an ideal, or in some cases to denigrate and gossip about something that is comparatively better that makes you feel worse. When we hurt internally, we can be confused about why we feel a certain way, not not how to resolve our internal conflicts and low self-esteem or self-worth. We instead continue to focus on things external to ourselves, such as people or events that we can more easily point the finger at or blame for our own inadequacies. Focusing on people can be a distraction, and so too can focusing on events. There are many events going on daily, and some are more dramatic than others that feed into drama, just like many people like to engage in when gossiping about others. If you spend most of your time discussing the events, they are more important than simply discussing and gossiping about individual people, but it can also serve as a distraction. The media brings up events every day for us to pay attention to and focus on. We then get caught up in the events happening around us, and even events that aren’t even around us but are happening somewhere else in the world. We can also get attached to an event being a catalyst or causal force that we need in order to produce certain effects in our lives. We think that we will have happiness or be happy, when something (an event) happens. We believe some events have to happen for certain things to come about in our lives, rather than taking up the power to make events happen in order to have certain things happen. The former is waiting for things to happen so that we can get what we want, while the latter is using our power of consciousness to create the conditions in our lives to get what we want. One is passive and the other is active. Some people externalize their power into other people, events or ideas, believing that only they have this cause-and-effect ability to create change. When people realize that they are the ones that make decisions and choices in their own life, then they can work towards getting what they want. A job promotion doesn’t just magically happen, it gets granted as a reward for work you do. Action was required to produce certain results. Don’t get confused into thinking that doing certain things will necessarily give you what you want either. Many people tend to be myopically focused on feeling good about themselves, and pursue happiness more than understanding what happiness is. Many people think that it’s up to their jobs, or their friends, or something else to provide them with happiness. Some people can think as they were told by others, that working hard, having a steady career for most of your life and raising a family is the key to happiness. Instead of trying to derive happiness ourselves, or understanding that happiness comes and goes as part of what happens in life and doesn’t need to be a constant “feel-good” static state within us, many people think that it’s up to others to generate happiness for them. This takes away our own responsibility for our own lives, and tries to place it in someone else’s hands, that we can then get upset and point the finger at someone else rather than ourselves. Imagine thinking that the responsibility to make you happy was up to your career and up to your employer to do that for you? Relying on others for your happiness is the path to disappointment and unhappiness. Events are created by people, but they happened, and are done with. The effects have manifested, and we can’t change them. There is only a certain level of utility in events, which includes to understand why they happened, and why they should or should not happen again. People die everyday, some in public events that carry across the globe, but then the event is fleeting and passes, just as individuals pass in time. Events happened, but they are less visible and evident to us compared to a person who exists in themselves while events don’t exist in themselves. People persist for many years, while events don’t usually last beyond a human lifetime. Many ideas are timeless. They can be created now, a thousand years ago or 10,000 years ago. Ideas can prove as useful now as they did in the past. We can envision ideas now and make them work, while in the past they could of been envisioned but were unable to be realized. The realization and actualization of an idea is what demonstrates its “greatness” through an ability to engage that idea with reality. Focusing on events or people prevents us from seeing ideas that can help us change what happens in the world (the future of events), and what happens in other people’s lives or who we allow into our own lives. “Timeless” truths can be realized by each individual which can have us change our recognition of other people, events and even ideas that we might have previously accepted as true but were false, or ideas we previously rejected as false but were true. If we focus on people and events, this can limit our perception of how things can be different. Only looking at what is going on now in terms of how certain people are, or the current condition of events taking place, can lock us into a learned helplessness where we lack imagination to envision how things can be different. About how things can be different for others, as well as ourselves, and the events that take place in our lives created by ourselves and others that form the human world and reality we live in. Engaging in ideas leads us to improve our desire/care/intent, thoughts, and actions in how we live according to those certain ideas that influence our worldview and selfview, like understanding morality, good vs. evil, truth vs. falsity, etc. Think about the time and attention you spend on inputting and outputting information. What is it that you are engaged in? Is it people? Is it events? Is it ideas? Gossiping about someone has a limited scope of importance in people’s lives. Usually it’s surrounding something they did, like an event that took place. The little things, the superficial judgments, are things that come and go in lower consciousness thought as people gossip about celebrity culture and entertainment in order to feel good about themselves. When an event takes place, this has a larger scope of relevance in our lives in other people’s lives, compared to gossiping which comes from one or a few individuals that agree about the insignificant and unimportant superficial criticism being delivered. Events can affect many people in a causal capacity which influences their decisions into the future. 9/11 was one such event that greatly affected many people on the planet, not only the United States. Events have greater significance and require more consciousness engagement and involvement with thinking to evaluate what is going on. Ideas are at the root of both previous categories. Ideas can influence people and motivate them to engage in certain behaviors. A poor or false idea can be envisioned and acted upon by a great many people to actualize it into reality, while a great or true idea can be ignored due to it not being understood and therefore not actualized to the degree of a simpler, more or less important idea. Ideas require the greatest conscious effort to formulate and understand whether they are of merit to realize and create into reality. An example from my own posts would be where I could talk about some individual, such as who some globalist, elitist or bankster and expose them. As I mentioned before, there is valid criticism to levy against an individual. Even if I did this, as informative as it might be, it’s only dealing with one individual and has limited scope of importance in individual lives, as well as through the span of time. Talking about an event, such as an alleged terrorist event which might be a false flag government operation, or funded and inculcated by intelligentsia, is information that affects many people on a larger scope and has more relevance in our lives compared to simply talking about one person. Similarly, talking about drone strikes and how that has affected all of us in the world in the past 15 years is also limited to a span of time. Ideas, however, have the greatest range of applicability and usefulness of information that spans many, and even all time periods. Talking about drone strikes from the past 15 years is important information for people now, but it might not be in the future, just as it wasn’t significant in any way in the past since drone strikes did not exist in the past. This is not timeless knowledge and information for anyone to use at any time. This is where ideas excel in importance of being discussed compared to events or people, and are the higher order consciousness engagement. Understanding consciousness, and developing self-knowledge, comprehending morality and the importance of truth in life, are “timeless” and “eternal”, in that they provide useful information in our lives now, 100 years ago, or even 1000 years ago. Important ideas are valid in no matter what age. Events are restricted to a certain time period that contain ideas that motivate people to create actions that lead to events. People create events based on ideas that motivate them. Do you see the underlying causal factor that drives it all? It’s ideas. An idea underlies why an event was created by people, and underlies the behavior that led a person or people to do what they did. 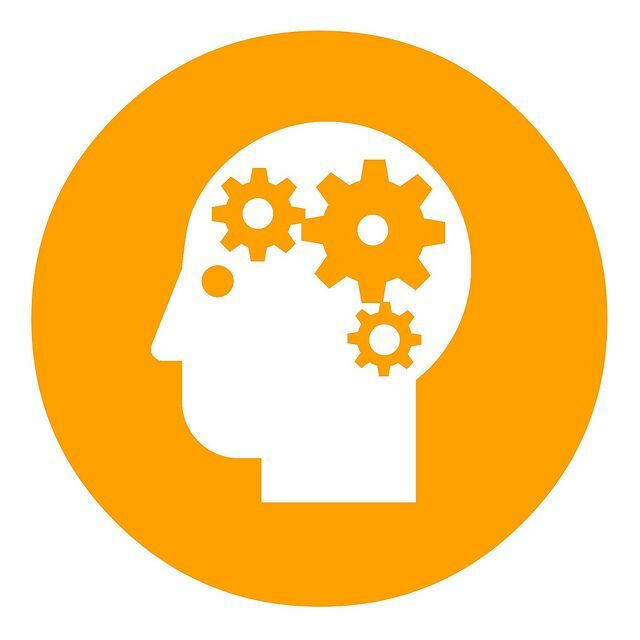 Our thoughts about ideas, and how we feel about them, will give a valuation, importance and salience which influences and motivates us in certain ways. The causal realm of consciousness is where the power is. We can imagine and envision ideas and alternatives to our current condition, the events that take place, and the behavior of individuals. The things that are most easily talked about and that many people seem to enjoy, are the lower consciousness modalities of gossip, celebrity, entertainment, having fun, and trying to make ourselves “feel-good” through our attachment to the pleasure trap. This is what many people view as most salient to which they apply a higher valuation, weight and importance in their lives for them to focus upon. It’s most important to them because it’s what makes them “feel-good” about themselves. Next up are the events that take place in our environment and are more localized to our time period in order for it to have an importance and valuation to us. Events often deal with how they affect us and others. It’s not so much only about us and how we feel, as some events can not even involve us, but involve others and through our empathy and sympathy we can recognize an importance in what happened within the current condition of the world. In either of the previous cases, ideas are still underlying it all. Information that people have been influenced with, such as ideas, have shaped their worldview and self view, which affects how they view themselves in relation to others and whether they engage in superficial judgments and gossip. Such ideas that shape worldview and self view also affect events that take place in the world where an individual or a group can make certain things happen. Whether this is from a terrorist bombing, to a country invading and murdering innocents, or a global world governance and global economic manipulations, ideas are at the foundation of it all through our consciousness which uses them to justify and motivate our behavior. People do things, events happen, and under it all is the meaning, the WHY, that these things happen. Most people don’t “have ideas” in-so-much as the ideas are what have them. We can grasp onto ideas, but then it’s the ideas that grasp us in consciousness. A mind-virus can be hard to get rid of. We are infatuated and inculcated with emotions as a result of imagery that is stimulus from ideas. To understand how ideas affect us as individuals, and others in the world, we look at the individual behaviors of people, the events that are created by one or many individuals, and this exposes the underlying hidden ideas that motivated and drove people to act in certain ways. Look beyond and behind the mere appearances and “physics” of how things visibly moved (either people changing their fashion, jobs, houses, cars, etc., or changing events in the world), and see deeper into the “metaphysical” substance of being that motivates behavior in the first place. Dig deeper to the underlying root causal foundation: the ideas that are generated from consciousness. The internal realm of consciousness is where we create our motivation, desire, drives and justification for what we do. That is the realm of power to affect change in life. Ideas are “infinite” and “timeless”, and they come from our symbolically “infinite”, “metaphysical”, “nonphysical”, “immaterial” and “hidden” internal realm of consciousness. This is where the substance and meaning for life and living can be understood. This is where morality is understood and is used as the substantive, authentic, genuine, realer, truer and higher motivation and drive to live. We can talk about people and spend our time and attention on that level of engagement, gossiping about useless things that people change about themselves that we don’t like (hairstyle, career, house, fashion, “Trump looks ugly”). We can talk about the events people have created (“Trump did this or that”). And we can talk about ideas that shape the world we currently live in, in order to better understand what is happening in the world, and the ideas that can change and reshape the world into a better condition for us to live in. The central quote above applies to generally describe the different levels of consciousness that people engage in. Those who engage the most in talking about people, have lower consciousness focus than those who talk about events, and both have lower consciousness focus than than those who go deeper to the substance that creates both events and what people do: ideas. People are “small” when they mostly talk about people, as this is the “small scope” of importance to be thinking or talking about. People are “average” when they mostly talk about larger matters that affect more people, so it’s of “average scope” to think or talk about. People are “great” when they understand the importance of ideas as the underlying, deeper factor and “larger scope” that drives the previous two across time and space (i.e. “timeless”). If we want to affect change in the world of effects that manifest, then we need to direct our time and attention at the root causal foundational level to change our motivations and desires. That is at the causal realm of consciousness where ideas are created or injected and induced into our consciousness through the influence of others. Time and attention is limited in life. Choose wisely. Where do you want to go? Spinning around gossiping about people, discussing temporal events that come and go, or dealing with developing a greater understanding of how things are this way and how to improve it? They are all connected, but the latter involves looking at people and events to understand what ideas are leading people, while both people and events don’t require looking at or thinking about the underlying ideas that motivate people or events to happen. The less aware we are of the motivations (ideas) that we or others are being led by, the less empowered and more difficult it will be for us and others to change. That’s how the quote can generally be described in my understanding. What does this quote mean: “Great minds discuss ideas. Average minds discuss events. 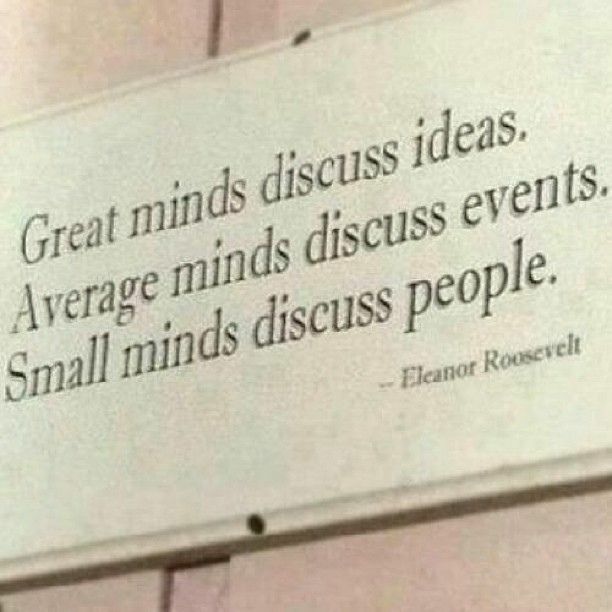 Small minds discuss people.”? Why small minds discuss people, average minds discuss events, great minds discuss ideas.